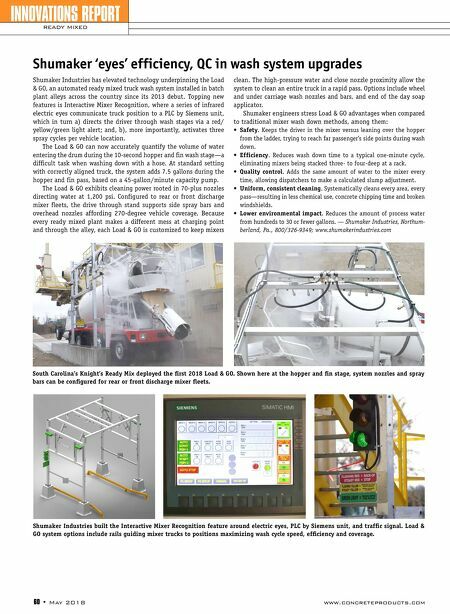 60 • May 2018 www.concreteproducts.com INNOVATIONS REPORT READY MIXED Shumaker Industries has elevated technology underpinning the Load & GO, an automated ready mixed truck wash system installed in batch plant alleys across the country since its 2013 debut. Topping new features is Interactive Mixer Recognition, where a series of infrared electric eyes communicate truck position to a PLC by Siemens unit, which in turn a) directs the driver through wash stages via a red/ yellow/green light alert; and, b), more importantly, activates three spray cycles per vehicle location. The Load & GO can now accurately quantify the volume of water entering the drum during the 10-second hopper and fin wash stage—a difficult task when washing down with a hose. At standard setting with correctly aligned truck, the system adds 7.5 gallons during the hopper and fin pass, based on a 45-gallon/minute capacity pump. The Load & GO exhibits cleaning power rooted in 70-plus nozzles directing water at 1,200 psi. Configured to rear or front discharge mixer fleets, the drive through stand supports side spray bars and overhead nozzles affording 270-degree vehicle coverage. Because every ready mixed plant makes a different mess at charging point and through the alley, each Load & GO is customized to keep mixers clean. The high-pressure water and close nozzle proximity allow the system to clean an entire truck in a rapid pass. Options include wheel and under carriage wash nozzles and bars, and end of the day soap applicator. Shumaker engineers stress Load & GO advantages when compared to traditional mixer wash down methods, among them: • Safety. Keeps the driver in the mixer versus leaning over the hopper from the ladder, trying to reach far passenger's side points during wash down. • Efficiency. Reduces wash down time to a typical one-minute cycle, eliminating mixers being stacked three- to four-deep at a rack. • Quality control. Adds the same amount of water to the mixer every time, allowing dispatchers to make a calculated slump adjustment. • Uniform, consistent cleaning. Systematically cleans every area, every pass—resulting in less chemical use, concrete chipping time and broken windshields. • Lower environmental impact. Reduces the amount of process water from hundreds to 30 or fewer gallons. — Shumaker Industries, Northum- berland, Pa., 800/326-9349; www.shumakerindustries.com Shumaker 'eyes' efficiency, QC in wash system upgrades Shumaker Industries built the Interactive Mixer Recognition feature around electric eyes, PLC by Siemens unit, and traffic signal. Load & GO system options include rails guiding mixer trucks to positions maximizing wash cycle speed, efficiency and coverage. South Carolina's Knight's Ready Mix deployed the first 2018 Load & GO. 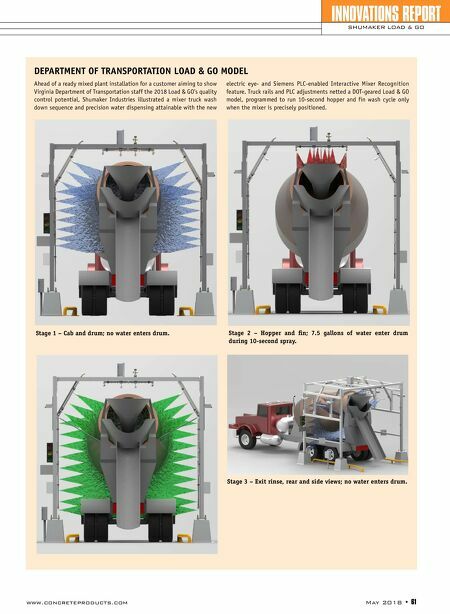 Shown here at the hopper and fin stage, system nozzles and spray bars can be configured for rear or front discharge mixer fleets.